One of these days I need to make hash for breakfast. Crispy potato bits, maybe topped with a lovely fried egg with a runny yolk… . What a great way to start the day. 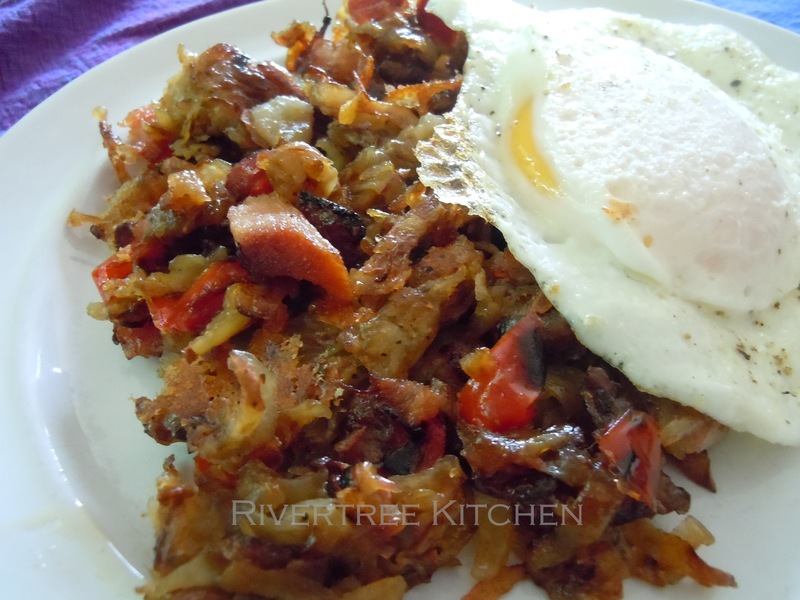 It’s not that I’ve never made hash; I make it all the time. We just prefer it for dinner. Do you have half a steak in the fridge from last night’s dinner, or one pork chop, or a lonely chicken breast? It’s not enough to feed the family, I know. But it’s fine for hash. Heck, if I wasn’t living with two fish-phobics, I’d use some leftover salmon. I’ve made hash with all of the above (except the salmon), and more. 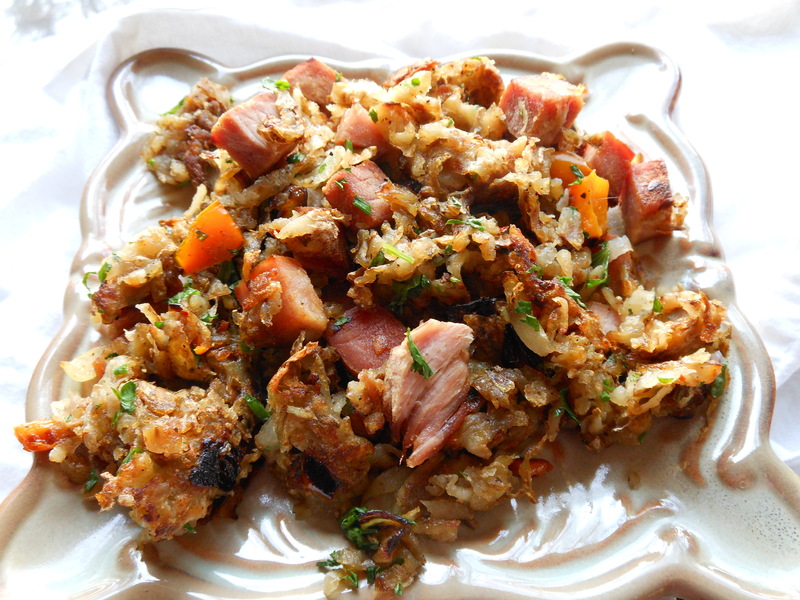 We love adding a cubed leftover ham steak or slow-cooked bone-in ham. This combo is even better if you add a sweet potato into the mix. We are of two schools in the Rivertree household as to the proper treatment of the potatoes. I prefer my taters cubed, but the guys lobby consistently for shredded potatoes. I usually let them win (see above photo). Usually. As enamored as I am with my cast iron skillet, I leave that aside and reach for the nonstick skillets for this dish. It could be that my cast iron is still in need of some seasoning, but I find the hash just sticks too much in it. *And yes, I said “skillets.” This works best if you can cook the hash in two large skillets; you have the most surface-to-tater ratio, which helps browning. If you only have one large skillet, use that; it may take a little longer. And for us, it’s all about the browned bits. You could certainly eat serve the hash as soon as the potatoes are cooked through and are exhibiting a few browned bits. But why would you? The best parts, as everyone knows, are those toasty edges, so why not go for as many toasty edges as possible? Top the hash with some fried or poached eggs if you wish. Serve it with a green salad, or with the always fabulous roasted grapes. Divide the oil, onion, garlic, and bell pepper between two large skillets. * (See above.) Set them over low heat to jump-start the cooking while you prepare the potatoes. Peel the potatoes if you wish (it’s not necessary), and 1) cut them into 1/2-inch cubes, or 2) grate them with a box grater or in your food processor. Dump the cubes or shreds in a colander and rinse them well. Pour them into a clean dish towel and pat them dry (for the cubes) or squeeze the heck out of them (shreds). This will remove some of the starch and help them to brown. Divide the potatoes between the two skillets and stir to combine with the now-softened vegetables. Season well with salt, pepper, and paprika. Dot with butter and turn the heat up to medium-high. Every 5 to 10 minutes, flip the hash and break it up. The goal is to achieve maximum crunchy bits. Since the ham (or your choice of meat) is already cooked, Add it toward the last 10 minutes or so of cooking. If you’re more into the contrast between a crisp exterior and a tender inside, leave the hash alone for a good 15 minutes, then flip and cook for another 10-15 minutes. If you want to reach hash nirvana, continue to cook, break up the hash and cook some more until you are happy with the way it looks. It takes about an hour the way we make it. Top with parsley and herbs and serve.